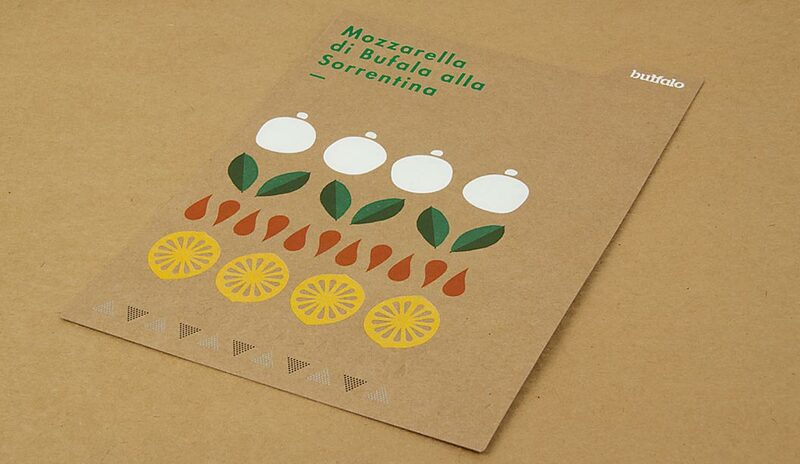 Agency: Recipe cards – Seesaw (VIC). 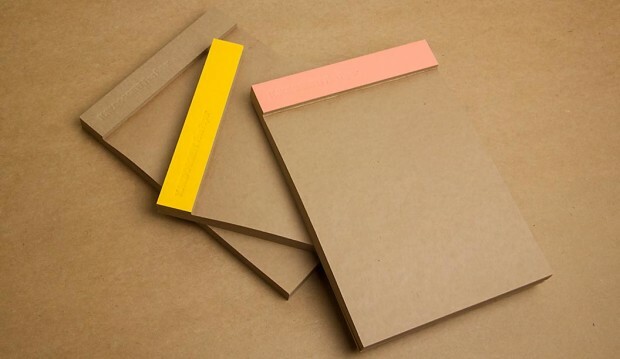 Notepads – K.W.Doggett Fine Paper. Stocks: Recipe cards – Buffalo Board, Kaskad Kingfisher Blue and Kaskad Fantail Orange. Notepads – Buffalo Kraft, Buffalo Board, Grange Tints Old Gold and Tablex Tints Salmon. 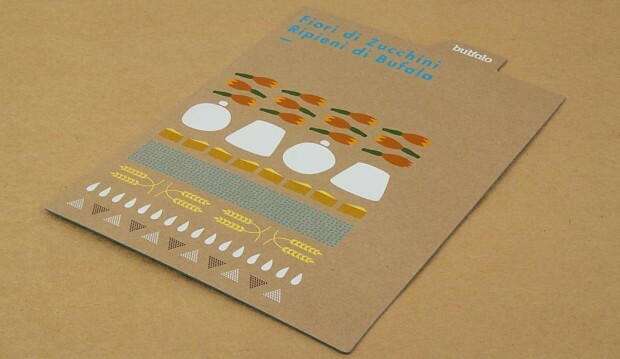 Printing specs: Recipe cards – Offset and digitally printed. 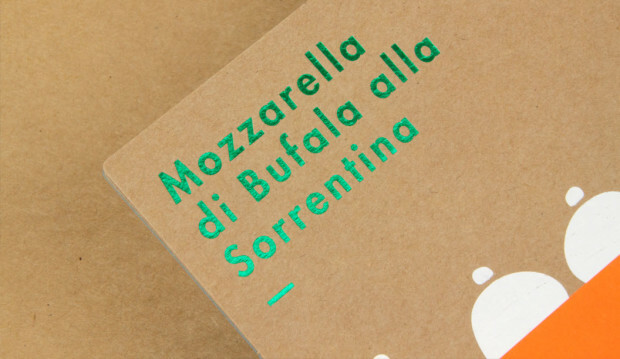 Notepads – Debossed. 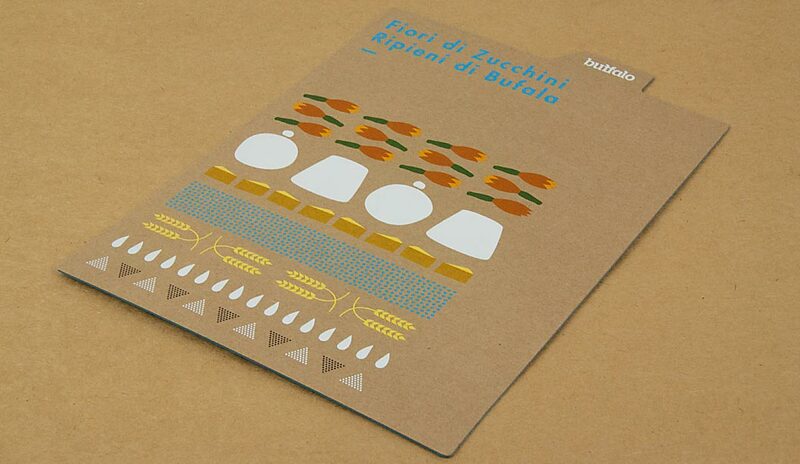 Printed by: Recipe cards – Bambra (VIC). Notepads – E.H. Stationers (VIC). 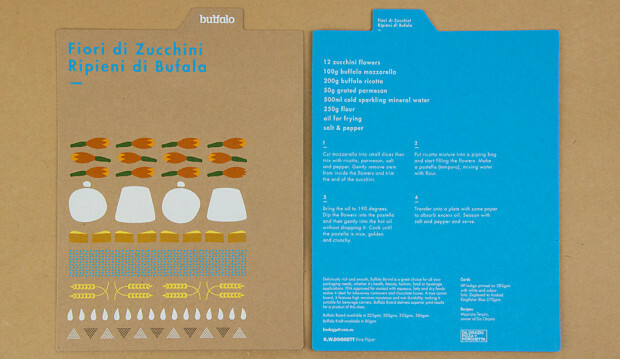 We have a fun, new and exciting Buffalo Board recipe cards promotion for you to feast your eyes on. The cards are a follow up to our previous promo in 2011. You may remember five recipe cards featuring mouth watering buffalo mozzarella dishes? Visit the post here. 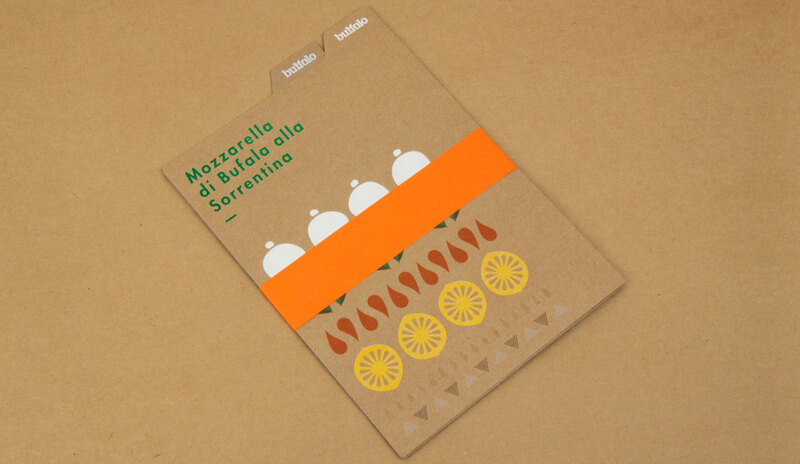 This latest set of colourful cards were designed by Seesaw and feature simple illustrative graphics that highlight the recipe’s ingredients. To showcase just how versatile Buffalo can be, Seesaw went to town with embellishments and we printed one card offset and the other digital. The recipes were kindly supplied by chef Maurizio Terzini, owner of popular Italian Restaurant Da’Orazio and the famous Icebergs Restaurant in Bondi. The offset card is printed CMYK on Buffalo Board 283gsm with three foils ie Clear, White and Milford Astor GFE123 Dark Green for some extra bling. The digital card was printed HP Indigo CMYK on Buffalo Board 283gsm plus Opaque White Ink and duplexed to Kaskad Kingfisher Blue 270gsm with Opaque White Ink (two hits) phew! To wrap them all up nice and neat we added a belly band in Kaskad Fantail Orange 100gsm. Buffalo Board is a low density, high yield product. It’s an uncoated, moisture-resistant folding carton board that is cost effective, has a verifiably low bacteria content compared to many other paperboard products and outstanding strength and durability. Buffalo Board is also available in 386gsm/711ums and is also used for health, beauty, fashion and beverage applications. It’s made from natural kraft fibres that are responsibly sourced and fully recyclable and is carbon neutral (measured exit mill gate). Buffalo Board is suitable for all kinds of jobs. 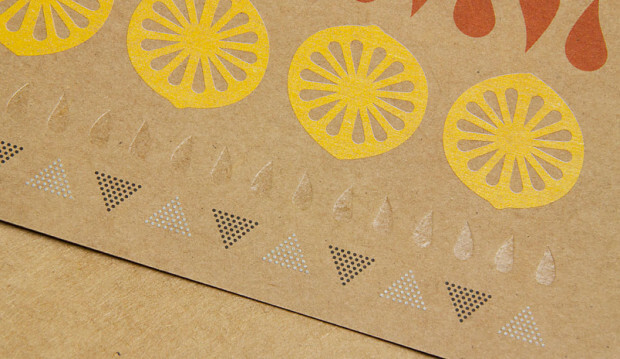 Think offset, digital and letterpress printing as well as embellishments like foil and screen printing. The natural kraft paper looks great with some white ink (consider two-three hits for offset and two hits for digital). If you want your CMYK colours to really pop, apply a white ink base first then a layer of CMYK over the top. This provides a surface for which the colour can sit up on, resulting in a brighter finish. You might like to do a combination of both like we did for the recipe cards (colours with and without a white base) to achieve a variety of printed effects. It comes up a treat! It’s no secret we have a thing for bling, but kraft could be a close second. So we’ve also produced a set of A5 notepads as a gift for our customers. They come with three different spine colours – natural ie Buffalo Board, as well as Grange Tints Old Gold 80gsm and Tablex Tints Salmon 150gsm. 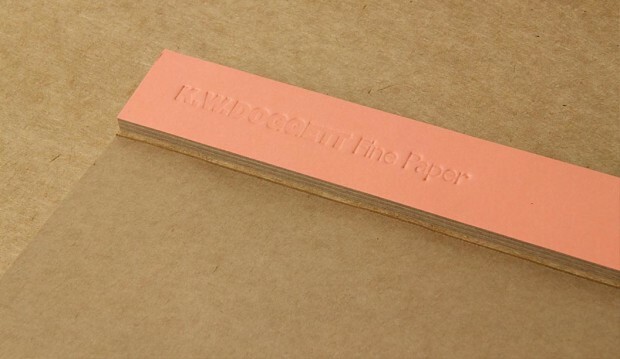 All have a subtle K.W.Doggett Fine Paper debossed logo on them. It’s also perforated along the spine for writing down quick and easy tear-away ideas. Our paper specialists and account managers are coming around to see you soon with your own copy. Enjoy!